Specialist Duncan Charman enjoys a memorable ‘Session’ on the River Loddon while filming with Fishing TV – and it’s heart stopping stuff! The Aldershot angler roves the river’s Farnham Angling AS stretch with pellet and paste tactics and works hard to bag fantastic chub going 5lb 1oz and 6lb 1oz – fish that will be much bigger come the winter. But the highlight is undoubtedly a pristine 12lb barbel from a swim no more than ten feet wide… and is his biggest ever from the stretch. “If anyone has any doubts as to why the fish in the river are packing on weight they have to watch the bit where one of the chub ‘passes’ the remains of a baby crayfish as I’m holding it up for a picture,” says Duncan. 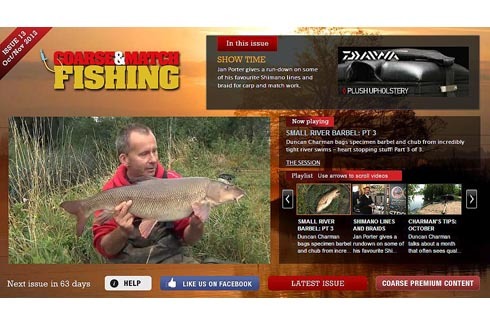 It’s free to view, split into three parts, in the October/November issue of ‘Coarse & Match Fishing’, which is free to view here on this site online, on i-pads and on i-phones and now also on Samsung Smart TVs.